Long Beach, Calif. – April 26, 2010 – Formula DRIFT launched the new Drift Stream with YoParts.com at Round 1: Streets of Long Beach with over 70,000 fans tuning in to watch the event live. The Drift Stream debuted to rave reviews from drifting fans across the globe after the announcement was made last month of the partnership of Formula DRIFT and YoParts.com to bring live interactive streaming to the 2010 Pro Championship season. The Drift Stream debuted at Round 1: Streets of Long Beach with over 45,000 unique visitors watching live over the weekend. The Formula DRIFT fans consumed over 1.6 million minutes of action in the 2-day event weekend. 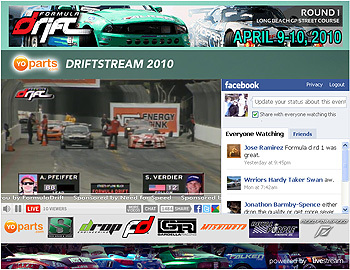 Fans watched on multiple websites and mobile devices that included the Formula DRIFT website, Facebook, and various personal websites and blogs. Viewers watched from over 128 countries with the country of Norway leading the way with over 5000 fans cheering and watching their countryman Fredrick Aasbo make his official Formula DRIFT debut and finishing fourth place overall at the event. 25,000 unique visitors also utilized the “On-Demand” feature of the Drift Stream player to watch all of the action from both Friday and Saturday’s event. The Drift Stream will continue at Round 2: Road to the Championship on May 7-8 in Braselton, GA when Formula DRIFT returns to Road Atlanta. Last season Round 2 proved to be one of the most entertaining and exciting events of the season with Formula DRIFT champion Chris Forsberg taking the victory on his way to the championship.